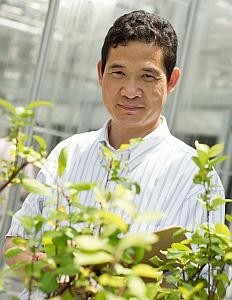 Why Arctic Apples Were Approved By USDA [Growing Produce 2015-04-29] – Kenong Xu, assistant professor, Horticulture Section, discusses the journey genetically modified non-browning Arctic Apples took in order to get the go-ahead from USDA to be grown and sold in the U.S. Chef + Plant Breeder: The Future of Flavor [Culinary Point of View 2015-04-09] – Interview with Michael Mazourek, assistant professor, Plant Breeding and Genetics Section and Chef Dan Barber exploring how they have spent the past 10 years working together to develop new organic crop varieties that emphasize flavor. Last Sunday, Carol Grove attended her last commencement breakfast and ceremony as Graduate Field Assistant. (She retires June 5.) As usual, she took some great pictures. Do you have pictures to share? Send a link to your album to cdc25@cornell.edu. 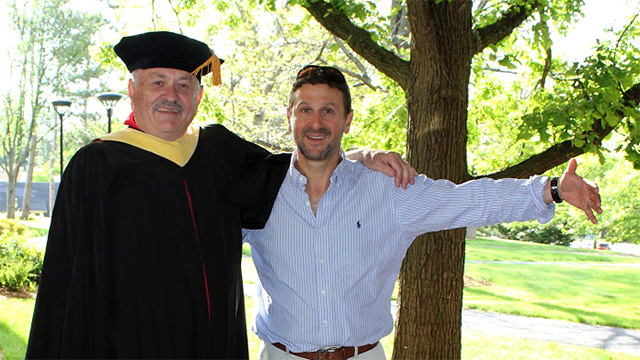 Bill Borgstede MPS ’15 and his advisor and associate professor in the Horticulture Section Frank Rossi. Cornell researchers now have a new, state-of-the-art greenhouse facility available to house tall crops important to New York State growers, such as corn, trellised peas, alfalfa and biofuel grasses. Precision environmental controls, 16-foot double-pane glass side walls, and shade- and insulation-curtains in all eight compartments create a highly energy-efficient research environment. 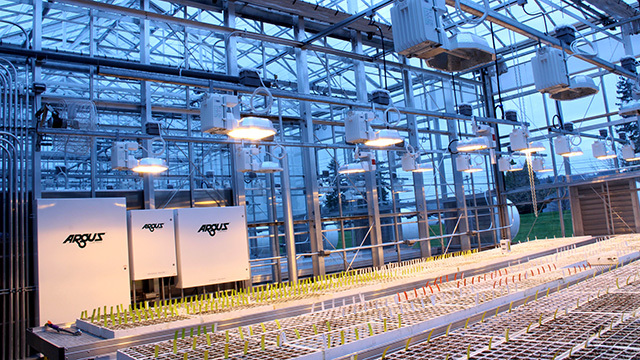 CUAES manages 179,000 square feet of greenhouse space on and around the Cornell Campus, making it the largest non-commercial greenhouse facility in New York. They house 200 to 300 research projects at any given time. The facilities are supported by a dedicated greenhouse team that is committed to sustainable practices and continues to implement new ways to reduce energy use and waste. 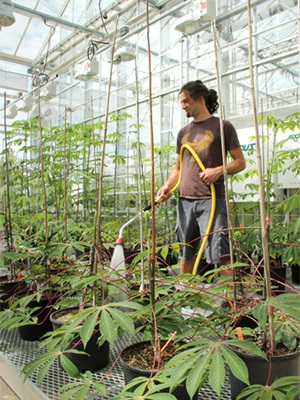 Right: Greg Inzinna, greenhouse grower with the Cornell University Agricultural Experiment Station, is tending cassava plants in the new greenhouses. This breeding project aims to improve agricultural productivity and food security in Africa. 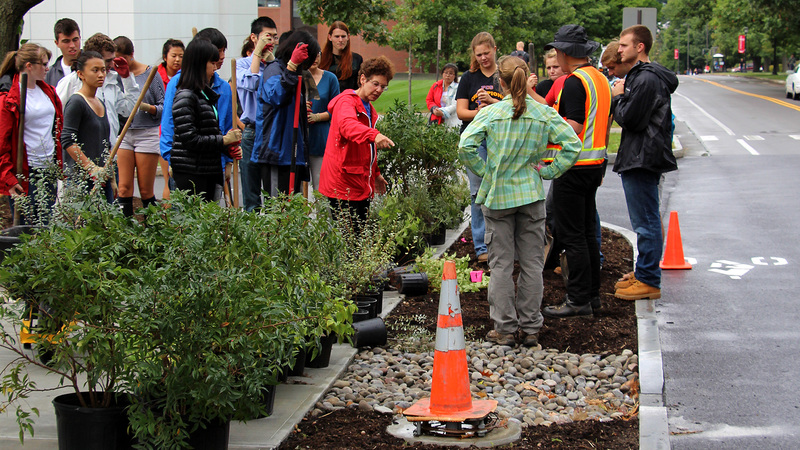 Nina Bassuk, professor in the Horticulture Section and director of Cornell’s Urban Horticulture Institute has been honored with the Teaching Award in the American Horticultural Society’s 2015 Great American Gardeners Awards. The award is given to an individual whose ability to share his or her horticultural knowledge with others has contributed to a better public understanding of the plant world and its important influence on society. 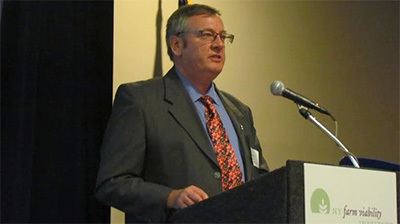 AHS notes that in addition to teaching college classes, Bassuk is co-author of Trees in the Urban Landscape: Site Assessment, Design, and Installation (Wiley, 2004), and has published more than 100 papers on urban horticulture such as evaluations of improved plant selections for difficult sites and improved transplanting technology. Bassuk is a member of the executive committee of the New York State Urban Forestry Council and received the Arthur Hoyt Scott Medal and Award in 2008 from the Scott Arboretum of Swarthmore College in Swarthmore, Pennsylvania. AHS previously recognized Bassuk with their Urban Beautification Award in 1992. Earlier this year, Bassuk received the Frederick Law Olmsted Award from the Arbor Day Foundation and was named a Stephen H. Weiss Presidential Fellow. 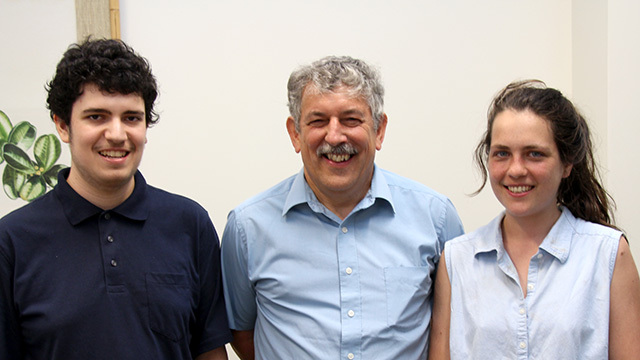 On Monday, May 18, the School of Integrative Plant Science held its annual luncheon to honor graduating seniors in Plant Sciences and recipients of two awards given out through the Horticulture Section to outstanding Plant Sciences students. Students were joined by Director of Undergraduate Studies Mike Scanlon, Horticulture Section Chair Marvin Pritts, and Plant Sciences Undergraduate Program Coordinator Leah Cook. Above from the left: Mike Scanlon, Liana Acevedo-Siaca, Princess Swan, Katharine Constas, Jeremy Pardo, Marvin Pritts, Leah Cook. Not pictured: Michael Gandler. Above: Horticulture Section chair Marvin Pritts congratulates Jeremy Pardo (left), who received the 2015 H.R. 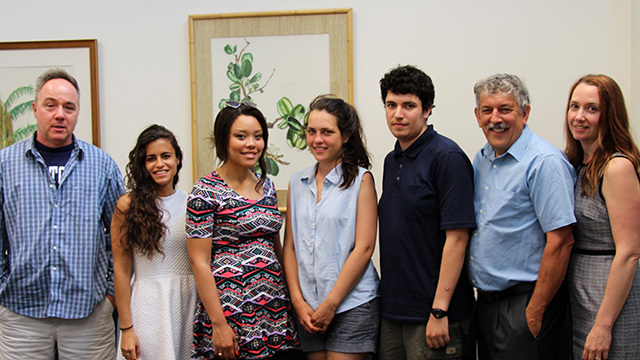 Schenkel Sr. Memorial Fund Award, which recognizes superior academic achievement by a sophomore or junior enrolled at Cornell University who specializes in horticulture, and Katharine Constas (right), who received the 2015 Kenneth Post Award, which is given annually by the Kenneth Post Foundation to an outstanding senior in horticulture and plant sciences. The award emphasizes academic achievement, but also considers character, leadership, participation in university activities, and promise of continued success in horticulture. 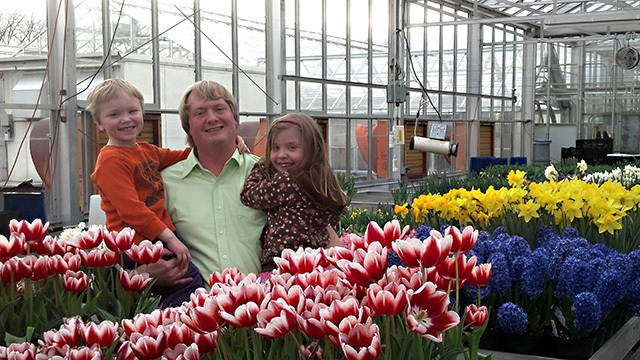 Jim Bittner, Chair of the Board of Directors of NYFVI and owner of Bittner-Singer Orchards. The New York Farm Viability Institute (NYFVI) announced that it is funding 21 projects at a total of $1,539,324 in 2015. 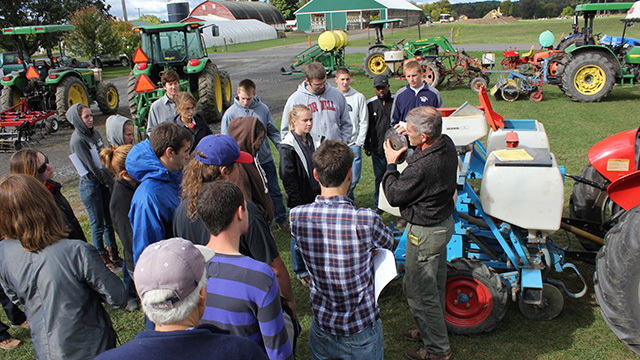 Grant recipients seek to build and share practical knowledge that directly improves the economic viability of New York’s farmers. “Our increased funding from New York State allowed us to support more projects, and a wider range of projects.” said Jim Bittner, Chair of the Board of Directors of NYFVI and owner of Bittner-Singer Orchards. In order to ensure grants address on-the-ground priorities, all proposals were evaluated by NYFVI’s extensive farmer review network. The Institute’s volunteer board or directors, comprised of ten farmers from across the state, made the final funding decisions. Low Tunnel Strawberries: A Cost-Effective Approach to Extending the Growing Season for NY Berries. 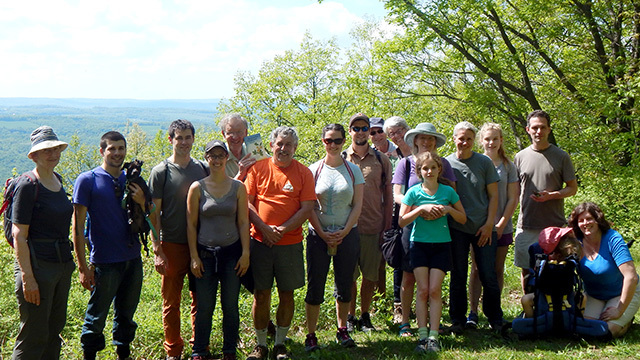 Eighteen intrepid hikers headed off to Thatcher’s Pinnacles in the Danby State Forest on Sunday to see an incredible view and many wildflowers and uncommon trees. Along the trail we observed American chestnut and chestnut oak, along with pink lady’s slipper in full bloom, Trillium grandiflorum, Canada mayflower, Gnaphalium obtusifolium, starflower, Polygala, geranium, Uvularia, and many more. Images from Larry Smart‘s shrub willow bioenergy crop research program are featured on the June issue of the Journal BioEnergy Research. 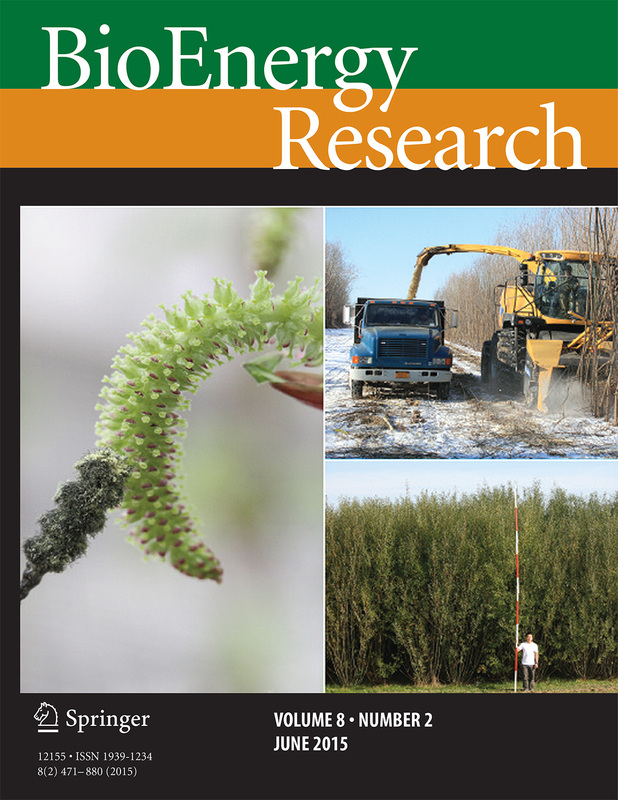 Smart and grad student Eric Fabio are among the co-authors of the article Untapped Potential: Opportunities and Challenges for Sustainable Bioenergy Production from Marginal Lands in the Northeast USA in the issue. Find out more about Smart’s research program at his Willowpedia website.